I like burritos from restaurants like Chipotle and Moe's Southwest grill. I also like frozen meals that are easy to make at home. So when I saw a new frozen burrito product available at Target, I thought I would give it a try. 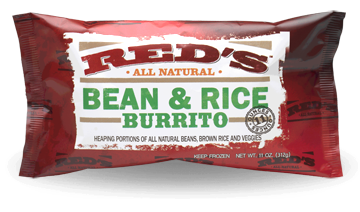 I went with the Red's All Natural Bean and Rice burrito. It was on sale for about $2.50, regular price, $3.50. The burrito is big, comparable to those at the restaurants I mentioned. A look at the nutrition facts reveals that it is pretty healthy with not too much saturated fat or sodium, especially for a 510 calorie meal. The ingredients are healthy and natural too. So I took it home and tried it. It took about 4 minutes to cook in my microwave. They recommend 3 minutes on each side. It was kind of watery when I took it out and cut it open. Then for the taste test. To my surprise it was very spicy, much too spicy for my tastes. After a few bites my mouth was already on fire. The packaging didn't mention anything about it being very spicy. I couldn't really taste anything besides the heat which was disappointing. I ended up just eating the outside tortilla and some of the black beans, but I had to toss the rest because it was too hot. Overall I think this product has potential if they cut down on the spice. I looked at the ingredients and it has chili pepper, cayenne pepper, and white pepper, so that is probably what is contributing to the taste. If you like spicy foods, give this one a try. The only other product I have tried which is similar to this is Amy's frozen burritos. The have a bean and cheddar burrito which is smaller, but pretty good. They usually sell for around $2.50. I buy these sometimes when they are on sale. Red's has several other varieties of burritos such as steak, chicken, pork, and turkey but unfortunately I will not be trying them after being let down by the bean and rice burrito. Be careful with your hearing by avoiding loud noises. This is pretty common knowledge, yet some people don't take it seriously until it's too late. Research shows that exposure to just one very loud sound or long term exposure to loud noise can result in permanent hearing damage. I am very careful about this, but sometimes you are caught by surprise by a loud sound and there is nothing you can do about it. Last week something like this happened. I was at work and someone slammed a locker very hard while I was standing near it. You wouldn't think that a locker is that loud but slamming it hard enough does make a loud enough noise to hurt your ear. At first I was startled by the noise and right after my ear began to feel uncomfortable. In the following days my ear began to feel full like there was wax in it, but there was not. It was not very painful, and I still had my hearing luckily, but it just didn't feel right. After about I week I got it checked out by a nurse. She looked inside and confirmed that there was indeed inflammation inside which was most likely causing the full feeling. Even thought it didn't hurt, having this kind of feeling in your ear is very bothersome and can pretty much ruin your day and not make you want to do anything. This was frustrating especially because it happened from something that was not my fault and I had no chance of avoiding it. Now it is about 8 days since the incident and my ear is feeling a little better, but still had a swollen feel to it. The nurse said it should go away by itself and I hope she is right. This is the first time I can remember a loud sound hurting my ears like this so maybe it was just a freak accident of being in the wrong place at the wrong time. Never the less, it is a good reminder to protect your ears and avoid loud noises whenever possible. Once your hearing is gone, it's not easy to get it back. So it's been about 3 weeks since the incident. My ear is getting better on its own but it is still not 100%. I actually went to an ear doctor a few days ago to get it checked out. They gave me a hearing test and my hearing is still good which was a relief. They didn't exactly have a good answer as to why my ear feels full or swollen inside besides the obvious that it was caused by a loud noise. They said it will either heal on it's own or it may just be like that for who knows how long. I have done a lot of research on this issue and have not found too many similar cases or treatments. Hopefully this article will help people who experience a similar ear problem. It's now been about 7 weeks since my ear started bothering me and still I have the feeling of aural fullness. Some days it is more noticeable than others. In some situations it is more noticeable such as if I am brushing my teeth or eating. I have been trying to avoid loud noises and limit my use of headphones. Covering my ear with my arm or a pillow seems to make it feel better for the time being, but does not get rid of the fullness afterward. This is pretty discouraging that this problem has lasted this long. It's not painful, but annoying. I have already been to an ear doctor so now I don't know what to do. I'll report back if it gets any better. 9 weeks and my ear is starting to feel better or at least it is not as noticeable as before. It seems like when I wear earbuds to listen to audio for extended periods of time, even when the volume is very low, it seems to make the fullness feeling come back, so I have tried to limit this activity. Overall it is a relief that it is getting better. My ear seems to be pretty much back to normal. I may have had some kind of fluid build up that was causing the full feeling because after a while I was able to get that popping sensation back, the kind you get from yawning or pressure changes. I'm not sure what caused it to start or why it took so long to clear up but I'm glad it is not bothering me like before. It has been a few years and overall my ear is better but from time to time it still gets a minor full feeling. It seems to be triggered by loud noise such as a noisy environment, or by listening to headphones for too long. I now try to avoid loud noise in order to prevent the full feeling from coming back. In case you will be in a situation where you know it is going to be loud, I recommend bringing ear plugs with. I have been using Hearos Ear Plugs for a while which are comfortable and help reduce the noise level in loud environments.